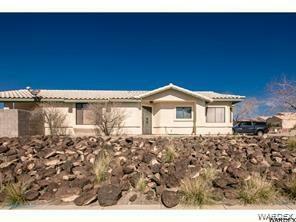 Well kept wonderful 3 bedroom two full bath home in desirable El Camino Village just off the Bullhead City Parkway. Minutes from community college and shopping centers. Move in ready home with tile and carpet throughout, cozy kitchen, vaulted ceilings, and low maintenance landscaping. Beautiful community park area with basketball courts and playground. Buyer to verify square footage, utilities, and flood plain.